The mall in DC is not only one of the biggest I have ever been to, it also has possible the coolest concept for a sushi bar I have ever seen. 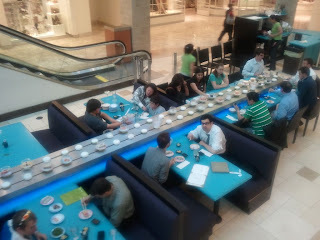 The sushi is in covered plates and on a conveyor belt. The belt continiously circles the bar area and you just reach up and take a plate as it goes by. My best description, a sushi-go-round. This is the picture of the day.